Aspiring singers listen up. 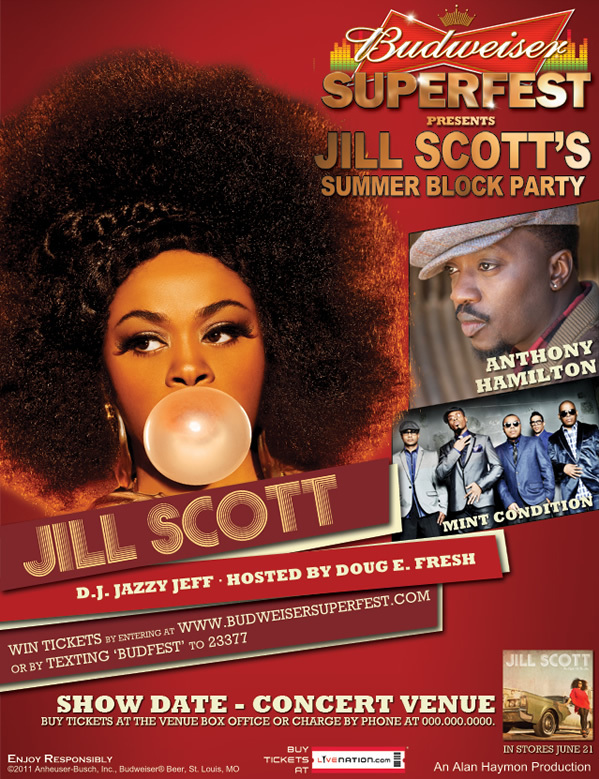 Myspace Music and Budweiser are giving you the chance to open up for Jill Scott, Charlotte native Anthony Hamilton, Mint Condition, Doug E. Fresh, and DJ Jazzy Jeff at the 2011 Budweiser Superfest tour, billed as "Jill Scott's Summer Block Party." The opening act competitions take place about a week before each of the 12 selected concert tour stops in July and August, from D.C. to Dallas, including Charlotte. The opening act competition here is scheduled for August 16, and the concert is August 24 at Verizon Wireless Amphitheatre. Here's how to enter the contest to become the opening act for your local market. You must be 21 years old or older; and go to www.myspace.com/budweiseropeningact, fill out the contest form, and upload a video of you singing one of two songs acapella: "One Last Cry" or "Sweet Thing." The submission deadline for the Charlotte show is July 28. A select number of contestants will be chosen to compete at the showcase on August 16, and the local winner will receive $5,000 and the opening slot at the tour stop on August 24. Plus, each of the local winners from the 12 cities will then be voted on in another competition, with the national prize winner receiving $25,000. In this video below, DJ Knuckles explains the contest rules.